This section contains information related to Fly British European, flight code BE, a low-cost carrier regional type. "The new millenium has seen a period of evolution for the airline. 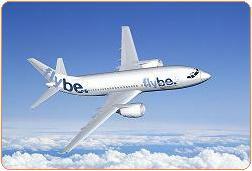 Following a change of brand to British European, the next stage of the development came on 18th July 2002, with the launch of a the new airline name 'Flybe' Along with the new image came a raft of fundamental changes to the business, with new deals for both the customer and the travel trade. Flybe has blended the innovative style of the new breed of airlines yet retained the service values customers have a right to expect. Flybe was formerly known as Jersey European, a major regional airline." Click to browse to the network development section of this site, featuring more more information on the network development of Fly British European.